that presents a cast of five solitary figures occupying both iconic and ordinary hotel rooms across Singapore. Filmed in situ, the individuals rehearse a disjointed textual collage of found dialogue, appropriated and spliced from scripts of famous films. The artist has decontextualised these conversations, in turn, reconstructing a potential narrative surrounding each character. Between the characters and their frames, Choo has carefully constructed uncanny coincidences that are incomplete, open-ended, and ambivalent. 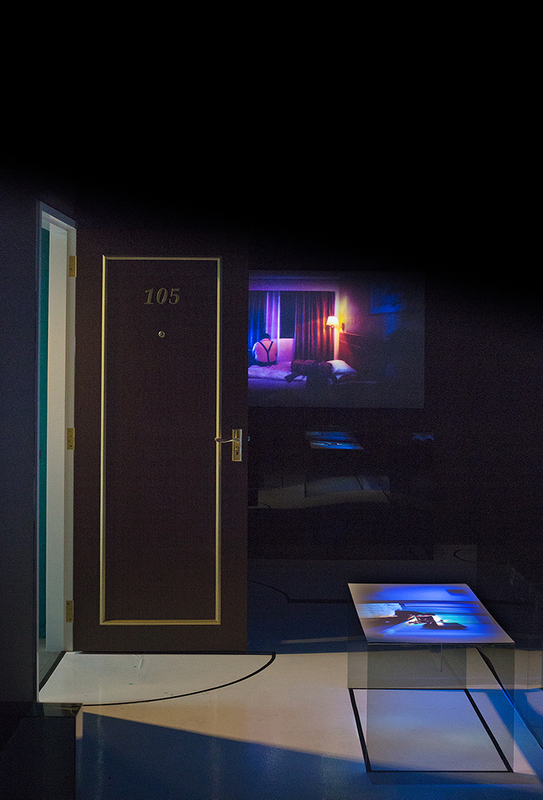 In this environment of staged intimacy, the five hotel guests seemingly speak to each other, encountering each other as strangers, yet simultaneously set apart. Projected on spectral acrylic objects that hint at the semblance of a quotidian space, the series of moving images enact elusive and allusive narratives. Each of these rooms tell of familiar strangers remembered, then forgotten. Rather than offering any kind of resolution to the histories of these characters and the sites they occupy, Accelerated Intimacy is a series of coincidences that are unfinished, culminating and ongoing, revealing further complexities upon each reading. Sarah Choo Jing, Accelerated Intimacy.